This white Clematis was painted with my latest process of using only three primary colors and letting the colors blend on the paper to make secondary colors. 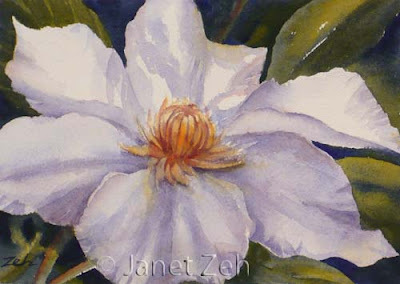 My latest watercolor floral work focuses on white flowers as they are exceptionally beautiful with this process. See more of my paintings at zehoriginalart.com. Thanks for stopping by. Have a beautiful day!